The Cybex VR1 Duals Hip Ab and Ad is part of the Cybex Duals line which utilises multi-function mechanisms to get two exercise types in one machine and thus save valuable floor space. The machine offers “slack-free” drive system that provides immediate engagement and broadens the range of motion because the resistance begins as soon as the exercise itself begins. This feature guarantees that the user doesn’t get part-way through the motion before the weight is engaged. It also ensures that the split is not wider than the user’s comfort zone. The machine uses knee pads as inputs which minimizes knee stress and keeps knees centred in the pad. 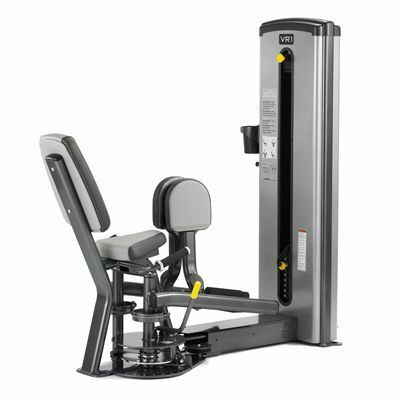 The machine also offers dual foot position to accommodate varying user heights. for submitting product information about Cybex VR1 Duals Hip Ab and Ad We aim to answer all questions within 2-3 days. for submitting product information about Cybex VR1 Duals Hip Ab and Ad. We aim to answer all questions within 2-3 days. If you provided your name and email address, we will email you as soon as the answer is published. for submitting product review about Cybex VR1 Duals Hip Ab and Ad.